Deidra sponsors a little girl named after her and Deidrea Laux. She wears a blouse of traditional design, hand-woven and gifted by a host family. An avid collector of Brighton Collectibles, Deidra, for the first time, sells some of her pieces to raise money for the 2013 trip. 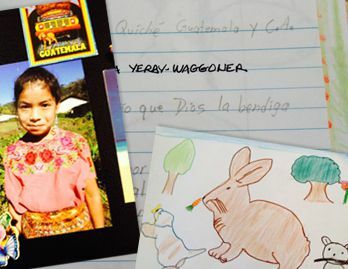 To stay in touch, Little Deidra sends letters and pictures to Deidra throughout the year. She's doing quite well in school. Deidra W shows Deidrea L a recent photo of their namesake. The women see each other more often now that they both live in the Dallas area. 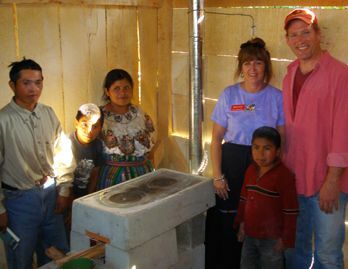 During their Thanksgiving week trips to Guatemala, Deidra and her husband, Darren, install life-changing stoves for Mayan families. At the end of a dirt road, up in the isolated mountains of Guatemala, Santa Avelina looks as it has for hundreds of years. The Mayan Indians in this tiny village lead modest but contented lives, in one-room shacks without plumbing, refrigerators or telephones. They survive by planting corn and weaving textiles. Then once a year, in late November, they hear the rumble of an old bus arriving with dozens of American volunteers. It’s as though the circus has come to town. One volunteer, Deidra Waggoner, has been making these annual trips to Santa Avelina for 15 years. Her team works with HELPS International to install cement stoves, a home improvement that seems like an Extreme Makeover to the locals. Time and resources permitting, the team also installs water filtration systems, helps locals pave mud floors and provides education and health care. Yet the installing of cement stoves remains the core program. Without them, families build fires in their homes in open pits, breathing toxic smoke and burning three times the wood that would be necessary in a stove. From its start in Santa Avelina, the program has spread throughout Central America and is now arriving in Africa. It has been recognized internationally, since its design suits traditional cooking methods, fitting in culturally as well as technologically. Beyond the work, Deidra’s team, led by John Sherwood, focuses on connecting with the community emotionally and spiritually. They attend services together at several churches in the village. On their last night in Santa Avelina, after all the installations have been completed, they invite the Mayan Indians who have helped them during the week to their Thanksgiving dinner. This signature event of Deidra’s team, which gathers about 70 people, is reminiscent of the first Thanksgiving, when pilgrims shared a feast with Native Americans. Deidra and John's wife, Diana, are the main cooks as the team prepares the entire meal, including traditional turkey, mashed potatoes, vegetables and pies brought in from America. Deidra, known as "the dog whisperer," even brings in dog bones and saves leftovers for the local dingos. The Mayan guests arrive with warm, freshly made tortillas. In Guatemala, sharing a meal carries great significance. Sharing so much bounty can be overwhelming for people who usually subsist on beans and corn. The volunteers and Mayan Indians may not speak the same language, but they reveal volumes with smiles, laughter and hugs. The bonds with the community extend beyond the week. Deidra currently sponsors a little girl to attend the school that her team helped to build. On the day they arrive, as their bus squeezes through the narrow roads to get to town, Deidra looks out the window to see the girl, smiling and waving in front of the school house. She is always there to greet the team on day one. The girl is named after Deidra and Deidrea Laux, the in-country director for HELPS during the early 2000s. Deidrea met the girl’s parents, Anna and Balthazar, on her first trip to Guatemala in 1997. Over the years, she would sometimes stop in to visit, since they live on the road to the school. One day they flag her down as she passes by, with the news that Anna has given birth to their fourth child. When they tell her the baby's name, Deidrea L looks at the new bundle of joy with hope and humility. Reminiscent of the first Thanksgiving, Deidra's team shares their holiday feast with local Native Americans. While Deidrea L has a satellite phone, the only place she can get a signal is on a ledge on the second floor of the school house. It's unsafe, but she climbs out there so she can speak to her family. Deidra W understands her loneliness and hugs her when she returns. She also invites her to be her roommate when the team travels to Antigua after the work week so she, too, can get a weekend of rest and relaxation. Kathleen Newton, another volunteer, sometimes rooms with Deidra W during their trips. She has an instant connection with Maria when they meet in 1998. Ten years old at the time, Maria has a sweet, innocent smile and seems very responsible for her age. Tragically, her husband dies suddenly while playing soccer, leaving her a widow with a young son when she’s 18 years old. 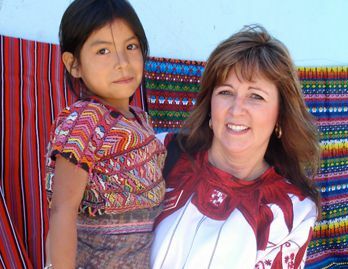 Kathleen helps her financially so she can attend nursing school in Guatemala City and pursue a path forward. Unfortunately, death occurs all too frequently in this part of the world. On a recent trip, Kathleen brings along a photo album of pictures taken the previous year. She is showing it to Maria and Anna when Anna suddenly starts wailing. Maria then also breaks down in tears. Through an interpreter, Kathleen learns that Anna just saw a photo that includes Teresa, her younger daughter who died two months earlier. Hearing this news, Kathleen starts crying also. Balthazar watches with a puzzled expression, not used to seeing such a compassionate reaction from an outsider. The mood changes suddenly when they hear pounding on the door. The volunteers are initially scared, but then realize that a mother with a one-year-old is standing outside. She has traveled for four hours, on bus and on foot, to try to get medical help for her son. She has already lost one child, and this baby is having an asthma attack. Immediately, a couple of tweens on the team pull out their inhalers. The medical volunteers work all night with the baby, who breathes normally by the morning. A few years later, the mother stops the team's bus to show the volunteers her son – by then a healthy four year old. Kathleen sponsors Little Deidra for a year before Deidra W asks to support her. 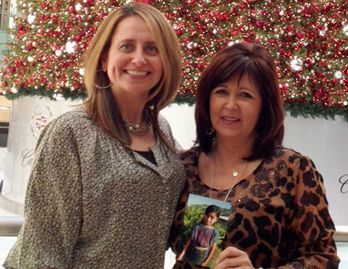 A former sales partner at Brighton Collectibles at Branson Landing in Branson, MO, Deidra W owns a vast collection of Brighton accessories and notices that Little Deidra loves “Brighton shiny things” too. She’s also fond of wearing Deidra W’s Brighton sunglasses. 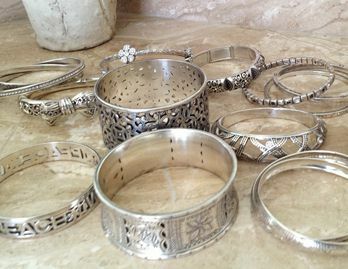 To raise money for this year’s trip, Deidra W for the first time agrees to part with many of her pieces. She selects 20 shoes, 20 handbags and 30 bangles and is holding a sale through word of mouth, email and text. The funds enable her to change a few more lives and share many more smiles, laughter and hugs.